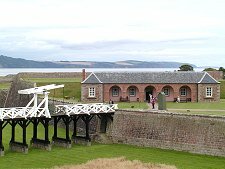 Fort George sits behind its massive grass-topped artillery defences on an isolated spit of land jutting west into the Moray Firth at Ardersier, 11 miles north east of Inverness. 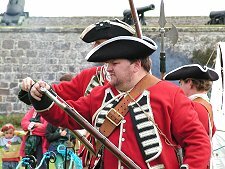 Conceived in the immediate aftermath of the 1745 uprising and the nearby Battle of Culloden that concluded it, Fort George was intended to be a once and for all solution to the threat posed by the Highlands, and the Jacobites in particular. 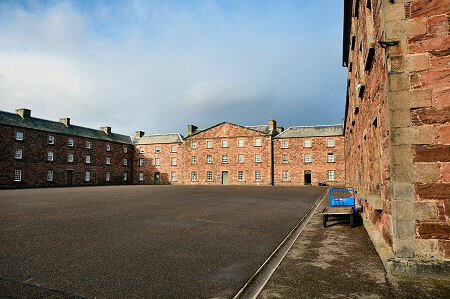 The man behind Fort George was William Skinner, the King's Military Engineer for North Britain. His original proposals were to build a fortress on the site of the ruins of an artillery fort Cromwell's forces had built at Inverness in the years up to 1657. 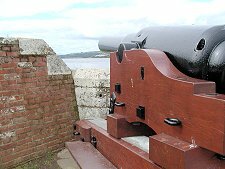 In 1747 Skinner let a contract for the fortress, only to have Inverness Council make a claim for compensation for the loss of the use of part of the harbour. He therefore looked instead for an alternative site. A spit of land at Ardersier seemed ideal, providing more space than the site at Inverness and being inherently more secure because of its location. Work began in 1748. Most of the skilled labour and the materials were brought in by sea and the construction site itself had to be defensible against attack. Around 1,000 soldiers were used to provide labour and to defend the area. By 1757 the main defences were in place and some of the internal buildings were starting to emerge, and the final building, the chapel, was started in 1763. 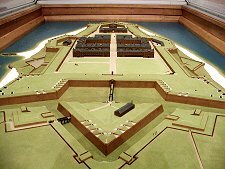 Fort George was finally completed, well behind schedule, in 1769. It was also well over budget. The original estimates for construction had been a remarkably precise £92,673 19s 1d. The final cost was more than £200,000, a figure larger than the Gross National Product of Scotland in 1750. What emerged at Ardersier in 1769 was perhaps the strongest fortification ever built in the UK. The end result was nearly contemporary with, but utterly different from, later phases of development at castles like Stirling and Edinburgh. Military fortification had entered the modern era. Two early visitors to Fort George were Samuel Johnson and James Boswell, who dined here whileon their tour of the Highlands and Islands. You can read Johnson's description here, and Boswell's here. 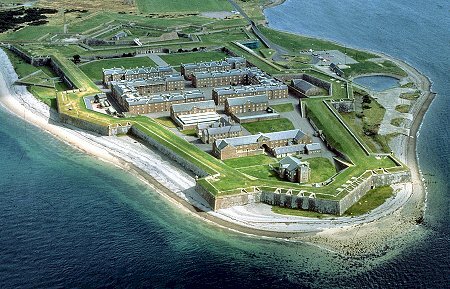 But although the need for it may have gone by the time it was finished, Fort George continues in use and is still operational as an army barracks today, though the Ministry of Defence has announced plans to close it by 2032. The huge fort covers 42 acres, and was designed to provide all the facilities of a small town. It comprised a comprehensive range of buildings to accommodate the Governor and other officers, the artillery detachment and a large infantry garrison. 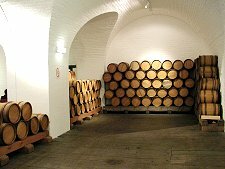 There was a bake house, brew house and chapel, a provisions store, powder magazine and ordnance store. 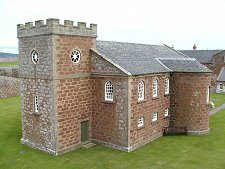 But perhaps the most remarkable aspect of Fort George today is just how little it has changed since its completion in 1769. What remains today is, with little alteration, what Skinner planned. And given this, perhaps the most impressive aspect of the Fort is just how modern it seems as you walk around. 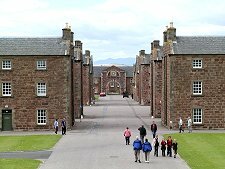 Fort George offers a fascinating day out. Visitors approach from the landward side where the slopping grassy banks designed to absorb artillery shells all but hide the fort from view. The visitor centre and shop is in the old guardhouse on the ravelin, a free standing defensive structure completely exposed to fire from the main fort. The main entrance is reached via a raised walkway, complete with drawbridge, across a wide ditch set between heavily defended bastions. The main walls are many yards wide and grassed over. Within them are set casemates, effectively underground bunkers designed to protect the entire garrison from artillery fire. 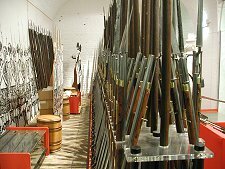 Inside the fort are the barracks built to accommodate the 1600 men of two infantry battalions, plus gunners for the artillery. 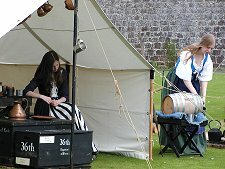 Part of one of the barrack blocks has been turned into a reconstruction of life in the early days of Fort George. 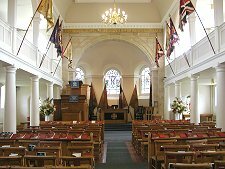 The chapel also provides a fascinating insight into life in the fort. Walled off to one side of Fort George is the Grand Magazine. 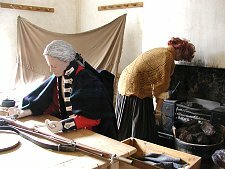 This has been fitted out as it would have been in its days as the main powder store for the fort, and it serves as a stage for actors recreating the lives and stories of soldiers in the 1700s. The magazine is also home to the Seafield Collection of Arms. In the Fort Major's house facing the parade ground is the Regimental Museum of the Queen's Own Highlanders, now more usually known as The Highlanders' Museum. 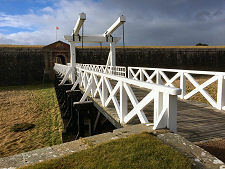 Other ways are also found to bring Fort George to life. On one visit a tented camp had been set up by the 36th Regiment of Foote, an amateur group who give drill and musketry demonstrations and recreate the daily life of Redcoats in the 1750s.